It is a collection of mechanism within an organism that protects against diseases by identifying and killing pathogens and tumor cells.It detects a wide variety of agents from viruses to parasitic worms, and needs to distinguish them from the organism’s own healthy cells and tissues in order to function properly.The immune system of vertebrae such as human consists of many types of proteins (immunoglobulins), cells, organs and tissues, which interact in an elaborate and dynamic network (world of immunity). The human immune system comprises lymphoid organs , tissue cells and soluble molecules such as antibodies. Lymphoid organs are those organs where the maturation and proliferation of lymphocytes takes place. 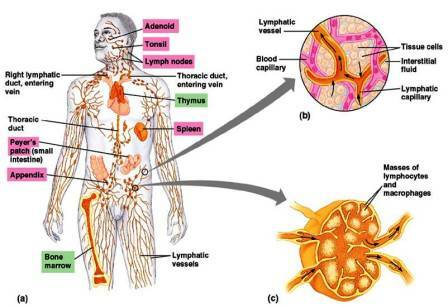 There are two types of lymphoid organs :primary lymphoid organs and secondary lymphoid organs. Primary lymphoid organs (Central Lymphoid organs) are those organs T lymphocytes and B lymphocytes mature and acquire their antigen specific receptors. Thymus and Bursa of Fabricus of birds are primary lymphoid organs. The bone marrow of mammals is considered equivalent to avian Bursa of Fabricius. Bone marrow is the main lymphoid organ where all blood cells including lymphocytes are formed. Thymus is the site of T lymphocyte maturation and bone marrow is the site of B lymphocytes maturation and are responsible for cellular and humoral immune response respectively. Secondary Lymphoid organs (Peripheral Lymphoid organs) are lymphnodes, spleen, tonsils, Peyer's patches of the small intestine, appendix and mucousal associated lymphoid tissue (MALT). After the maturation, B lymphocytes and T lymphocytes migrate via blood vascular system and lymphatic system to the secondary lymphoid organs where they undergo proliferation and differentiation.